User’s of Apple’s iPhoto software will notice that the responsiveness of the application is a function of the number of images (or size) of the photo Library. Once my Library contained over 1000 images, the application began to slow considerably. iPhoto Library Manager to the rescue. Additionally, a small shell script run from cron can notify me by email when my current Library is getting close to 650 MB. 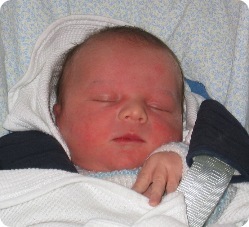 Lance Nicolas Henderson, born May 19, 2003 at 4:45 p.m. 3.8 kg and 52 cm. Mother, sister, Lance and daddy all doing great! Posted on May 21, 2003 April 20, 2015 Categories Life2 Comments on Happy Birthday Lance! Interesting article about test-driven development based on an interview with one of my preferred software development authors, Martin Fowler. bbrown discovered what must be the world’s worst looking bank website. Check out the breathing blob. Over on Macintouch, there’s a lot of discussion ongoing about music encoding — Which is better AAC or MP3? What bit rate is required for sufficient quality? How does the LAME encoder compare to the encoder used in iTunes 4? Folks are expressing some fairly strong opinions. One popular post is someone’s personal comparison of music samples encoded with MP3 and AAC over a variety of bit rates. Sound quality is described using terms like “brighter”, “fuller”, “wider”, “clearer”, “deeper” and “more dynamic range”. In my humble opinion, such reviews should be taken with a large grain of salt. Some years ago, I worked as a student in the audio laboratory of Dr. Marshall Leach. During that time, I was amazed at the number of folks visiting the lab, claiming superior audio quality from things like gold capacitors, “high-end” cabling, and expensive speakers. What was even more amazing was that many of these folks continued to firmly hold their opinions in spite of laboratory demonstrations to the contrary. A good example is loudspeakers. It’s actually not too difficult to build a near-optimal loudspeaker system — i.e. optimal in the sense that it produces a flat frequency response given a spectrally flat input (noise). Such speakers, which almost perfectly reproduce their input signals, are consistently rated poorly by audiophiles. Today, I compared a music sample encoded on the Mac using the LAME MP3 encoder with VBR, high-quality, and specifying an average target bit rate of 128 kbps, with the same sample encoded in standard 128-kbps AAC using iTunes 4. I listened to these two clips, running concurrently in QuickTime Player 6.2, and simply could not tell an audible difference. Physically the AAC file was 3.5 MB, compared to 4.6 MB for the MP3. I would love to find a more technical comparison between these format. I would suppose that the such a comparison could be done through a frequency/spectral-power analysis of the data composing the song. Has anyone seen anything like this available? We use the DynDNS.org service for DNS management of some of our hosts behind non-fixed-IP ADSL connections, and had (until now) used the MacOS X-based DNSUpdate client. This client proved a bit too unreliable, and now (thanks to the Unix layer of MacOS X) are using the Perl-based ddclient and cron. Much more reliable! Given the atrocious visual design of the VersionTracker.com website, coupled with the arrogant attitude of their staff towards the user comments on the new design (“Reading the comments of you folks just makes me giggle.”), I’ve switched to MacUpdate.com. My ADSL and internet service provider, Telefónica España, just installed a network of transparent proxy caches. I suspected this when last week I suddenly lost my ability to immediately see updates to modified websites, and then confirmed with the ip-calculator service. Any suggested solutions (other than changing providers)? 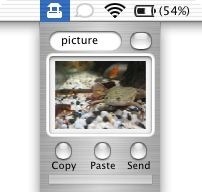 If you’re blogger on the Mac OS X platform, and like to include images in your entries, you’ll likely find ImageWell one of the most useful utilities around. Just saw this great post by NSLog(); pointing to someone’s commentary about what life will really be like when Microsoft achieves their grand integration plans. VersionTracker 6. Oh my goodness. If you want to see what techies are capable of doing when they’ve got their hands on a lot of data and a relational database, and no idea whatsover of user-interface design, have a poke around the new and improved VersionTracker.com. Consistent alignment? Nope. Consistent color use? Nope. Consistent anything? Nope. Sensible use of contrast? Nope. Related things visually grouped. Not hardly. I think every techie (myself included!) should frequently have a read of [[[The Non-Designer’s Design Book, by Robin Williams]]]. Posted on May 6, 2003 November 12, 2014 Categories Tidbits1 Comment on VersionTracker 6. Oh my goodness. As you can see, I’m redesigning the site (none of the Section links work yet.) Hopefully this won’t be a complete exercise in the name of vanity, since we’ll also be installing Movable Type for the Marbella Cycling website, and I’ll use the same mixture of MT templates and PHP that this site is now using. Just a quick note to mention that when iTunes 4 asks if you want to “Replace Existing” songs when re-encoding, what it really means is “Move Existing to Trash”. As I’m re-encoding my entire CD collection to AAC, I just happened to notice in the info bar of a Finder window that my disk had only a few hundred megabytes of free space left. The trash was full (several gigabytes) of my old MP3 that had been moved there by iTunes 4! I’m currently reading through Mac OS X Hacks, by Rael Dornfest. It’s a good read, with some interesting OS X tricks and tips (like controlling iTunes via Perl). Finally some books are starting to appear for the Mac non-beginner. (Thank you O’Reilly & Associates!) I’ve also added his weblog to my NetNewsWire “7+/-2” list. With three cycling clubs in a small town like Marbella, you can imagine that its a fairly popular sport here. A friend of mine (Diego López Luque) and I even started a small website, MarbellaCycling.com dedicated to local scene. As you can see from the website, there’s a weekly calendar of rides. Today, May 1st (a holiday here), was probably the hardest of the year –Peñas Blancas. This ride starts from Marbella and heads down the coast to Estepona. In Estepona, we turn right and began the monstrous 16km climb up to Peñas Blancas. When the professional tours come through this area (e.g. the Vuelta Espana), this is considered a “Category 1” climb, one of the hardest. The first five kilometers of the climb are brutal, and that’s precisely where the attacks started. I’ve still got a long way to go in recovering my form from last year, so I didn’t even attempt to cover the attacks today. I arrived at the top in good condition, and was pleased not to have experienced any hip pain. (I think I’ve finally recovered.) Diego did very well, finishing 3rd. Palmi won the race (no big surprise), and Belga was extremely strong today, finishing 2nd. This coming Sunday, it’s Estepona and then Istan, another climb, but not nearly as hard. Posted on May 1, 2003 May 24, 2013 Categories SportsTags Cycling2 Comments on Vaya Paliza! Now that the Mac and the iPod support the AAC format, I’m re-encoding my CD library. The iTunes “auto-import-and-eject” feature makes this task much less daunting than it could be. Casually popping in CDs while I work, I should have the entire collection done in a few days. Since my original encodings were done at 192 bps (with variable rate enabled), the average filesize was about 7.5 megabytes. With AAC and 128 bps selected, it looks like that will be reduced to about 4.5. (1) It saves time. You can spend loads of time trying to find and successfully download a song encoded with sufficient quality. I consider 20 minutes of my time saved worth a bit more than $1. (2) Identification of new music. Being able to browse the service, check out recommendations of others, and listen to 30-second clips of songs and artists I’d otherwise be unware of are definite advantagse of this mode of music shopping. What I’m now looking for is a URL format to allow exchange of song/album recommendations. NSLog(); reports that work on this is underway. By the way, the port to open in order to share your iTunes music is 3689 (use your firewall). Although the south coast of Spain is known for fresh fish, few things are tastier than a tender and juicy rotisserie chicken (or, Pollo Asado, in Spanish) with a plate of homemade french fries from Pollo Andaluz, a small chain of take-out rotisserie. Combine that with a chilled bottle of Rioja rosado, and you’ve got a meal to remember. If you’re ever around the Marbella area, be sure to check it out! Posted on April 29, 2003 Categories Tidbits1 Comment on Pollo Andaluz! I guess it was about a year ago, Apple Computer introduced the combination of an MP3 player (the iPod) and companion software (iTunes) for the Mac OS X. The tight integration of an innovative device like the iPod and easy-to-use software like iTunes made Apple (and its users) the envy of the music-loving Windows world. While users of other MP3 players could carry around a few CDs worth of MP3, iPod users could tote around thousands of songs in the ultracool device. While others continue in their pursuit to copy the iPod and iTunes, Apple yesterday took a huge leap forward, through the introduction of iTunes version 4, and launching its own Music Service. iTunes users can now, within the same easy-to-use interface, access a library of more than 200,000 songs, purchasing albums for an average of $10 or, probably more importantly, individual songs for 0.99 cents. Every song in the service has a 30 second immediate preview, to allow listen-before-you-buy. Purchasing couldn’t be easier. Once you’ve setup an account, just click the buy button on any song or album, confirm the purchase, and the song is immediately downloaded and stored in your songs library. To be honest, I’m personally quite worried about such convenience, being a music lover and an impulse buyer! Having tried the service out this morning, I’ve already purchased four songs, and can’t imagine an easier or more convenient way to shop for music. Tyler Hamilton wins at Liége-Bastogne-Liége! In the biggest win of his career, Tyler Hamilton becomes the first American to win the Liége-Bastogne-Liége, one of Europe’s most important cycling events! Although all eyes were on fellow American Lance Armstrong to win the famous World Cup race, it was Hamilton who lauched the key solo attack with 3 km remaining for the win. Former Armstrong teammate, Tyler Hamilton is making quite a name for himself as the leader of the Danish CSC racing team, beginning with his 2nd place finish at the 2002 Giro de Italia. CSC won’t be defending that position this year, however, as all their efforts are focused on denying Armstrong his fifth Tour de Fance victory. With riders like Hamilton, Levi Leipheimer and Jan Ullrich showing strong form, the 2003 Tour de France is shaping up to quite a battle! 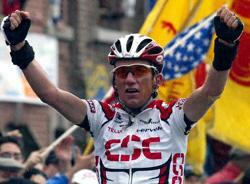 Posted on April 28, 2003 April 19, 2015 Categories SportsTags CyclingLeave a comment on Tyler Hamilton wins at Liége-Bastogne-Liége!